The Cape Malay community is an ethnic group or community in South Africa. It derives its name from the present-day Cape Town of South Africa and the people originally from Maritime Southeast Asia, mostly Javanese from modern-day Indonesia, a Dutch colony for several centuries, and Dutch Malacca, which the Dutch held from 1641 - 1824. 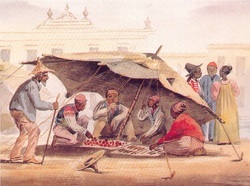 The community's earliest members were enslaved Javanese transported by the Dutch East India Company. They were followed by slaves from various other Southeast Asian regions, and political dissidents and Muslim religious leaders who opposed the Dutch presence in what is now Indonesia and were sent into exile. Starting in 1654, these resistors were imprisoned or exiled in South Africa by the Dutch East India Company, which founded and used what is now Cape Town as a resupply station for ships traveling between Europe and Asia. They were the group that first introduced Islam to South Africa. The first group of Malay state political prisoners landed on the shores of South Africa from Java and the neighboring Indonesian islands in the late 1600's. Many more followed in the years 1727 until 1749. Not only did this proud and attractive people bring with them the Muslim faith and fine architecture, they also brought with them a unique cookery style, introducing exciting mixtures of pungent spices that has had a heady influence on traditional South African cuisine. Indeed, the Malay-Portuguese words such as bobotie (a curried ground beef and egg custard dish), sosatie (kebabs marinated in a curry mixture) and bredie (slowly cooked stews rich in meat, tomatoes and spices) are integral in our cookery vocabulary.